(Lysander, NY – October 18, 2012) – Joseph M. Clayton, a back seat passenger in the Pontiac Grand Prix, from 5908 Alban Court in Liverpool, NY has died from his injuries in the crash. 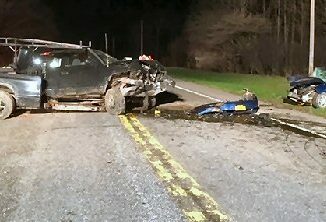 (Lysander, NY – October 16, 2012) – State Police has released the name of the driver, Keisha M. Gray, age 20, formerly of Piqua, Ohio who was the driver of the Pontiac Gran Prix killed in yesterday’s fatal crash. LYSANDER, NY – State Police in Lysander are investigating a fatal two-car crash that occurred at 12:30 a.m. today (Oct. 15) on Interstate 690 in the Town of Geddes, Onondaga County. The investigation has determined that a 1997 Pontiac Grand Prix was eastbound on I-690 when the operator lost control causing the car to spin into the concrete median coming to rest in the passing lane of I-690 east. A 2009 Mitsubishi, driven by David P. Grice, 25, from Fulton, was also traveling eastbound, unable to avoid the Pontiac, struck the car on the driver’s side. The identity of the driver in the Pontiac has been tentatively identified, however the name is not being released until next of kin has been notified. The front seat passenger in the Pontiac, Ryan P. Misener, 21, from 4798 Black Oak Drive in Liverpool, was killed in the crash, troopers said. A back seat passenger in the Pontiac, Joseph M. Clayton, 28, from 5908 Alban Court in Liverpool, was taken to Upstate Medical Center for severe head trauma and internal injuries and is listed in critical condition. Mr. Grice was transported to Upstate Medical Center for internal injuries and is listed in serious condition.